This slice goes hand in hand with the previous subject of 'Audience and Authors' to really get to the details of how the SOP will be written, and how it will look and feel to get the message across in the best possible way. Remember at this stage to keep it simple, sometimes the best SOP is an environmental SOP, where a document or procedure is not required at all. Simple examples of this could be: if you want people to walk in one direction around the laboratory or factory, would an arrow on the floor and walls work? If things need to be done in a particular order, could that be achieved by layout, labelling and numbering? These environmental SOP’s used in the correct circumstances can be far more effective than any documented version. 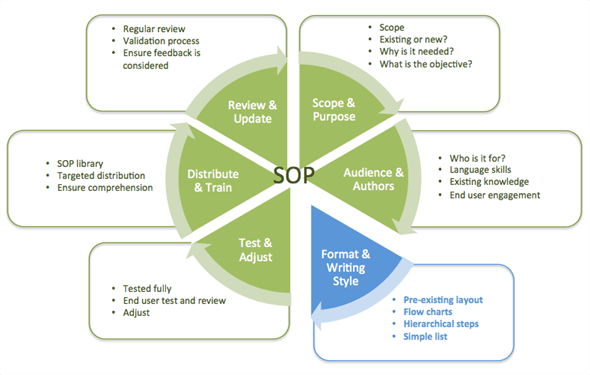 Is this an existing SOP that is working and just needs a refresh and update?...or similarly, do we have a standard format in use for SOP’s, does it work, and would it work in this scenario?…. If it isn’t broken don’t fix it!! If there are many routes through the process, then it may lend itself to a flowchart layout. – Research shows that 83% of human learning and understanding occurs visually. Is the process very long and involves various levels of audience? - Then it may be better to have hierarchical steps i.e. a list of main steps with sub steps underneath, giving clarity and separation of responsibilities. Is it a simple routine with a few steps? – Then as with many things in life, the wisest option is to keep it simple….a list may just be the most effective format. Ensure any text in the document is clear and concise. If it is difficult to follow, that will almost certainly stop the SOP being used. Try not to use any reference to the person, (You, He, She, Him, Her). Ensure steps are clearly referenced in order to help with ease of reference and ease of maintenance in the future. Break up large chunks of texts with diagrams and flowcharts; remember a picture paints a thousand words. So we are now finally in the place where the SOP is written. We have a full understanding of what we are trying to achieve, who our audience is, who the contributors are, and how we are going to layout the document. I would like to get a copy of this guide. I would like to purchase or obtain a copy of this series.